Let's not even talk about the title. Okay let's. Today's high is 80 and it is December 3rd folks! Urghh. As Christ followers, yesterday kicked off the season and celebration of Advent. Advent is a special time where we anticipate the coming and birth of our King on Christmas Day. 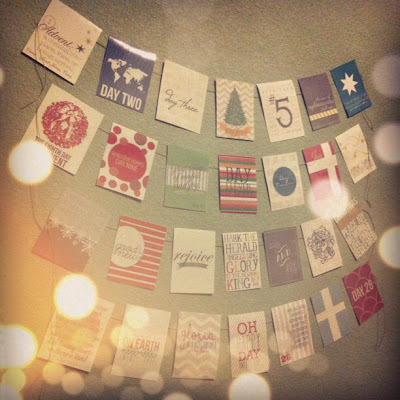 I hung our Advent calendar this weekend, purchased from Naptime Diaries. Jon and I will be using a reading plan from SheReadsTruth and also a devotional, We Will Wait, by Heather Boersma, to prepare our hearts with The Word. 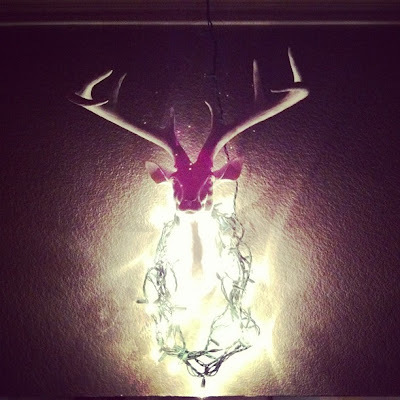 Lot's of Christmas-y things happened around our house this weekend. Jon put up Christmas lights on the exterior and I can't wait to show you! Our house was made for Christmas lights and unfortunately our ladder doesn't reach the tallest peak of our 2 story plus an attic house. We tried calling a company to come out but they couldn't come until the 10th so we are going to make due this year and call before Thanksgiving next time :-). We still need a few things...namely a star or angel for the top of our tree. I looked at Hobby Lobby, Wal Mart and Target and didn't love anything. Our tree is big and beautiful and I want to be excited about what we put on top. Any suggestions? Adorable ornament sent to me by Heather from The Mosbys in China! I love it! It was cold for about 2 seconds last week and we bundled up to go walk around the neighborhood to look at lights. 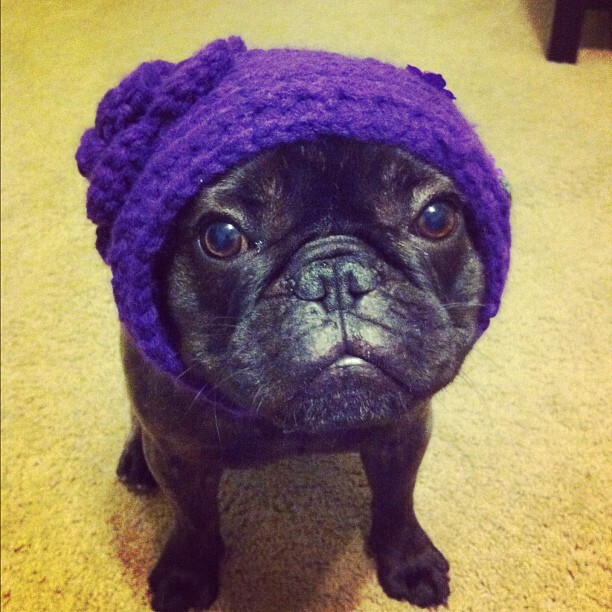 Ernie wasn't a fan of my crocheted headband ear warmer but he looked like a little old woman I loved it! He's funny because anytime I dress him up, he stands perfectly still and won't move..perfect for pictures. Saturday morning I left before 7am to head to College Station for the Be The Match Zumbathon. It was a great turnout and so much fun! I thought I was going to pass out while teaching my first song...it was the first workout I'd done in almost 2 weeks (being sick sucked), but after a few minutes I got past it. 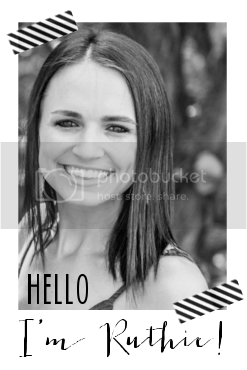 We heard from donors and recipients and I am SO glad to be a part of this organization. Please friends, read this post and think about being a part of the registry. I went to lunch with my little sister and some of her friends then got to see the sorority house (we are both Delta Gamma's and she lives in the house this year) and see old friends. I could barely lift my arms that afternoon and had a hard time staying awake on the drive home! We wrapped Christmas presents, watched movies and passed out early (I wasn't the only tired one). 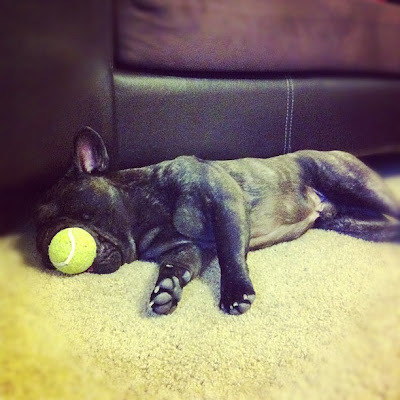 We've been trying to remember to take his ball away from him at night because he is so obsessed but when we forget, he falls asleep with it in his mouth like a stuffed Christmas piggy. Ernie's life pretty much rocks! After 10 hours of sleep, Sunday was another fun and productive day....church, a fun lunch out with my parents, and getting stuff done. 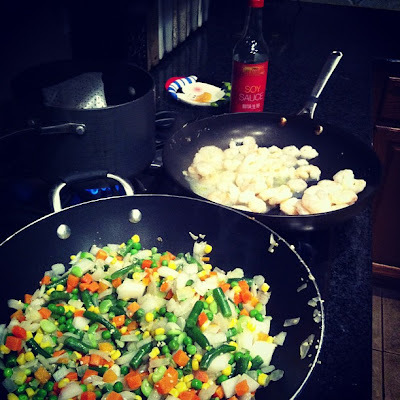 Jon and I love seafood but don't make it too often at home so I have been on a mission to add more of it to our meals. In fact, I had fish tacos at lunch yesterday and then made shrimp fried rice for dinner. I made a double batch so we will be eating it for the next 6 days haha. Check out the recipe here. We literally have something going on every single night after work for the next week (and possibly into next week, just haven't let myself think about that yet!) but it's okay because it's all fun stuff! We talked a lot this weekend about how people are just generally happier and more generous and giving during December. Wish it was year round but if scrooges are pleasant 1 month out of the year, I'll take it! 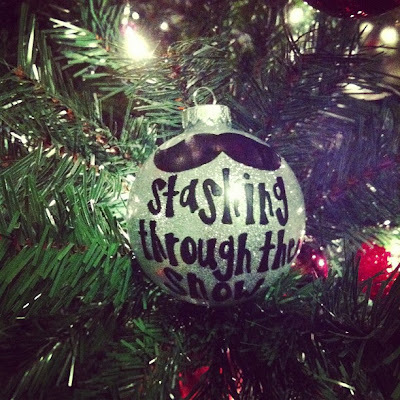 Don't feel bad about not finding anything to top the tree. We've had our tree for 6 years (EEK!) and we still haven't found a topper that we love. Ugh. Here's wishing for cooler temps. So glad you've been having so much fun! oh my gosh, I feel ya about the weather - high today is 76 in Birmingham...boo. I just can't get on board with the idea of paying someone to put up Christmas lights. almost everyone in my neighborhood does because our houses all have ridiculous roofs, but we are the one crazy family you see out there with a giant ladder struggling with the lights. I think part of the resistance just comes from it being a family tradition - I've been helping my dad put up lights since I was in 5th(?) grade. now thanks to our crazy roof we just have to be more creative in where we hang them! Yes, let's talk about this horrible "winter" we're having. It snowed 3 years ago Sunday! 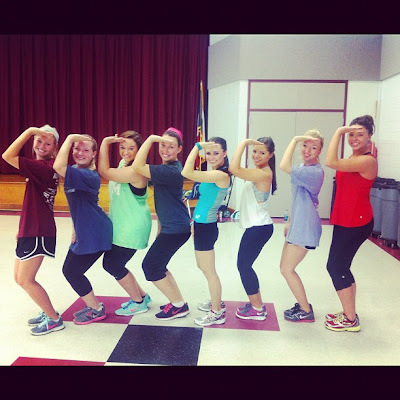 Love the DG fitness girls! And Ernie is making a face like "Mom, why do you do this to me?!" Ugh, I can't wait to meet him in real life!!! It was freezing here last week and today 70 and rain! Ernie and his ball. I hope Santa brings him and your family overjoyed live and lotsa balls. Oh it will be so magnificent with a baby now. Love you Ruthie!